Part 1 of this series described the bird ringing site at Fynbos Estate. This property, partly wine farm and partly nature reserve, is in the northwestern corner of the Paardeberg. The closest town is Malmesbury, in the Swartland region of the Western Cape, north of Cape Town. The bird atlas grid cell into which Fynbos Estate falls is called pentad 3330_1845. 14 checklists have been made for this pentad and a total of 134 species have been recorded, between 2008 and 2019. If you go to http://sabap2.adu.org.za/coverage/pentad/3330_1845 you get a map of the area with the pentad highlighted. To see the full list of species, click on “Species list” below the map. The 14th bird atlas checklist was compiled during the pioneering expedition and listed 79 species. Four of the overall list of 134 species are only recorded because they were mistnetted and included in the 14th checklist! These species had evaded the previous 13 atlasers. One of the characteristics of bird ringing is that there is usually a small number of species that constitute about two-thirds of the sample, and then there is a long list of species that are mistnetted in small numbers. The ones featured below are an arbitrary selection of a handful of the 27 species which were ringed on the pioneering expedition (19–28 February 2019). The list starts with two of the common species, and after that the choice is fairly idiosyncratic, but includes the four that were not in the bird atlas! 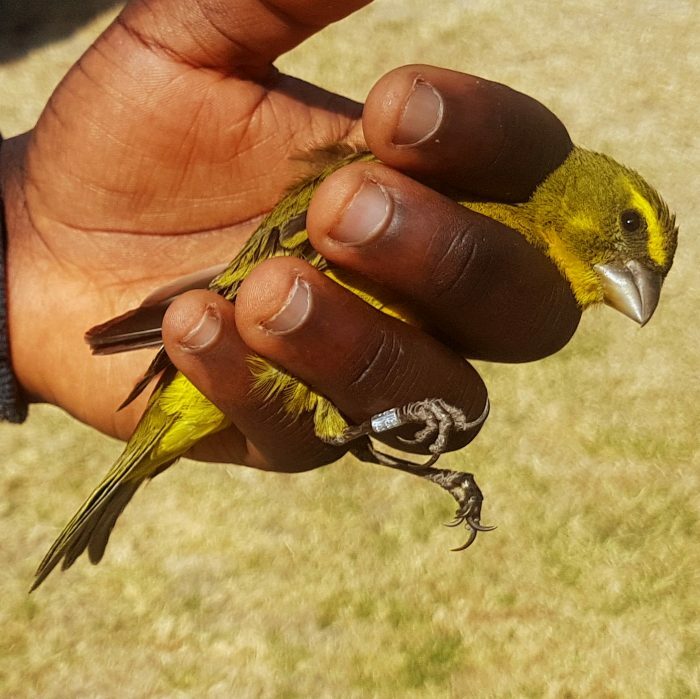 This Cape Weaver Ploceus capensis has been ringed and is ready for release. The biscuit-coloured eye is diagnostic of a male. This was the most ringed species at Fynbos Estate, so it is a key study species. The late Sir Clive Elliott did his PhD on the Cape Weaver in 1973 and a couple of the chapters in Dr Dieter Oschadleus’s PhD deal with its primary moult patterns. There is rather little else of substance published about the Cape Weaver! But there are lots of research ideas from the two theses to follow up on. For example, Dieter’s PhD showed variability in the annual timing of moult, and how this related to the local timing of rainfall. This has a climate change theme. 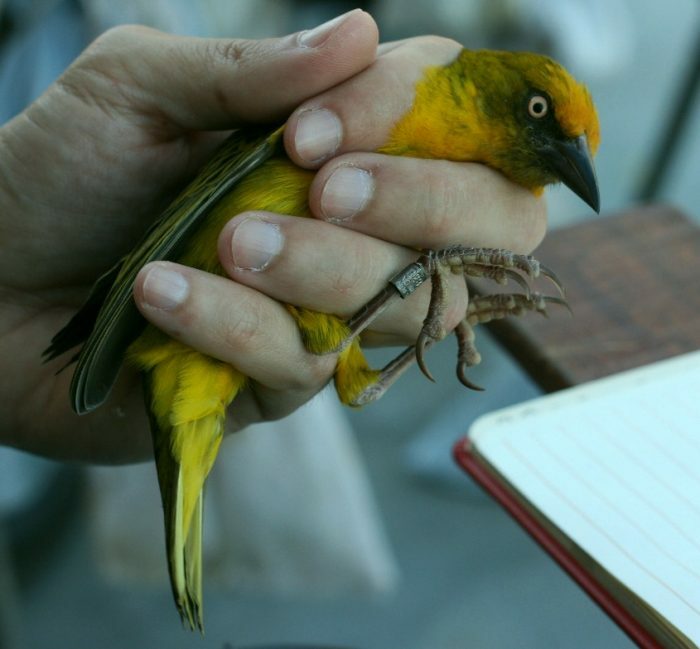 The bird atlas map shows that the Cape Weaver is endemic to South Africa and Lesotho. The areas shaded dark blue, where the reporting rate is highest, are in the two major agricultural areas of the Western Cape, the Overberg (east of Cape Town) and the Swartland (to the north). Fynbos Estate lies within the core of the distribution in the Swartland. Cape Weavers breed in large colonies, in trees or reeds over water. In the non-breeding season, they roost in large numbers in reed beds. Most mistnetting of Cape Weavers at Fynbos Estate is done at sunrise near these roosts. 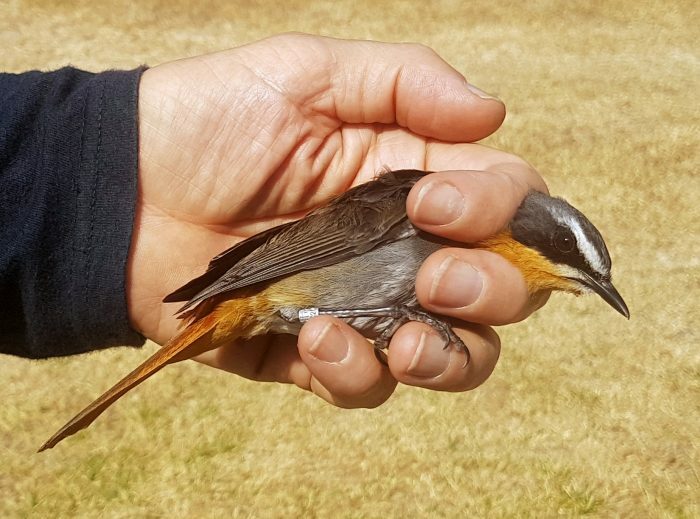 Another species that has obvious potential as a study species at Fynbos Estate is the Cape Robin-Chat. It is trapped (and retrapped) regularly. It is a candidate species for intensive colour-ringing study of the home ranges of individual birds and of seasonal survival rates. A comprehensive literature review of the species is quick and easy. There are two papers, one by Bunty Rowan published in 1969, and one by Digby Cyrus in 1989. Terry Oatley wrote a comprehensive essay on the species in his 1998 book “Robins of Africa.” That is just about it! A common species, but nevertheless poorly studied. The Barn Swallows Hirundo rustica which migrate to South Africa for the southern summer breed in Europe and Asia. They breed all the way from Ireland across Britain and continental Europe to a long way east of the Ural Mountains in Asia. The “composition” across South Africa varies. Swallows in the Western Cape are a mix from the entire breeding area. So when this Barn Swallow sets off in migration, it could be heading for Ireland, or Siberia, or anywhere in between. In contrast, the vast majority of swallows in Gauteng go to the eastern half of Europe. Swallows in KwaZulu-Natal are mainly from Asia and the eastern half of Europe. Barn Swallows do their primary moult in South Africa, and the timing of moult is slowly changing with the earlier arrival of spring in Europe. Long-term monitoring helps us discover whether the birds are keeping pace with climate change. 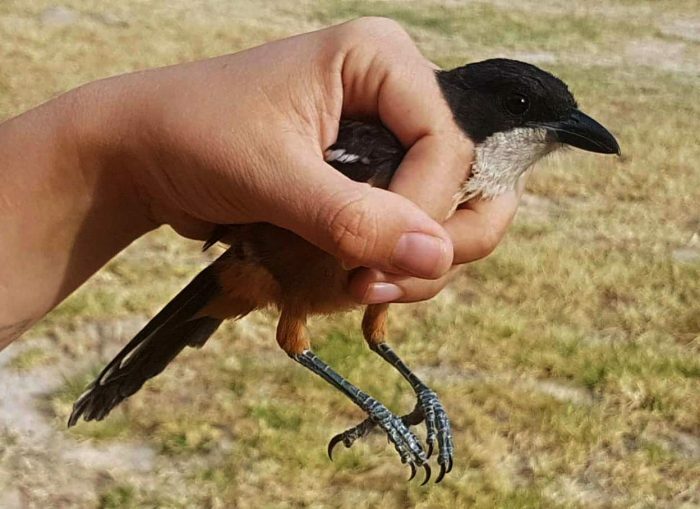 The Southern Boubou Laniarius ferrugineus has an uneven distribution in the northern arm of the Western Cape. Its preferred habitat is dense, tangled undergrowth, which becomes increasingly patchy. It is near the edge of its range at Fynbos Estate, and this was one of the species which mistnetting added to bird atlas species list for the pentad. In fact, we ringed three at Fynbos Estate during the expedition. The wheatfields of the Swartland start a kilometre or two to the west, and from here to the sea there is little habitat suitable for Southern Boubous. From here, the distribution extends northwards in the increasingly isolated forest patches along the mountain chain, through the Cederberg to the mountains. The last of these patches is immediately east of Vanrhynsdorp, and that is the northern limit of the species. An uncommon but attractive species at Fynbos Estate is the African Paradise-flycatcher Terpsiphone viridis. In the Western Cape it is a migrant, absent from May to September. It arrives quickly in September, and breeding activity peaks in November and December. Departure is dragged out, with individual birds leaving anytime between January and April. Where do they go? 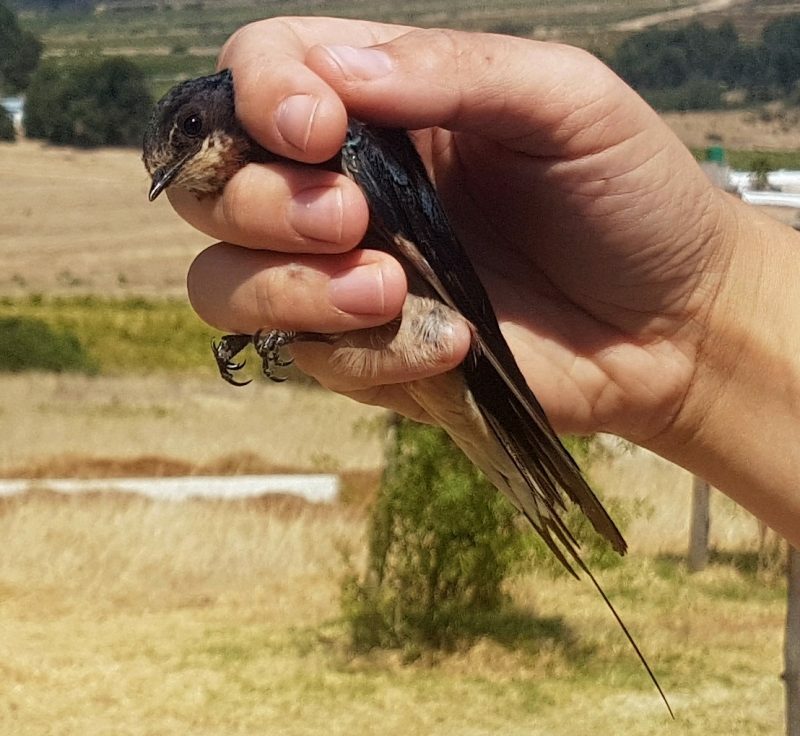 This bird, a female because of the short tail, might be the first from the Western Cape to be “recovered” and tell us exactly where they migrate to. 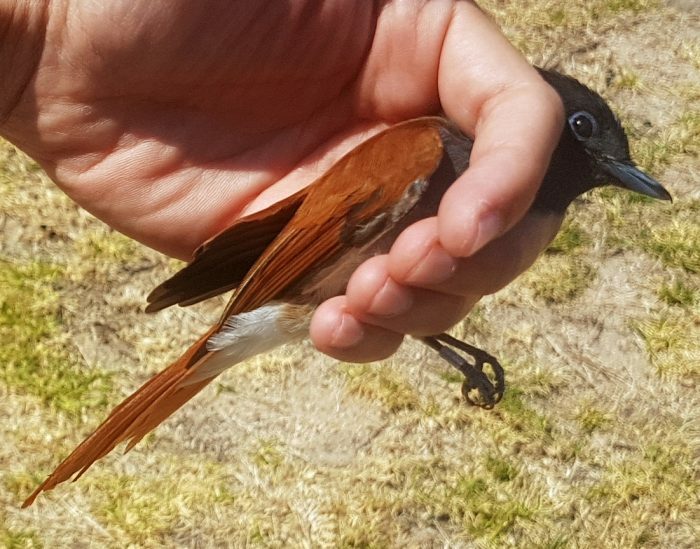 We think the non-breeding range of the paradise-flycatchers of the Western Cape is mainly northern KwaZulu-Natal and Mozambique. But there are no ring recoveries to confirm this. 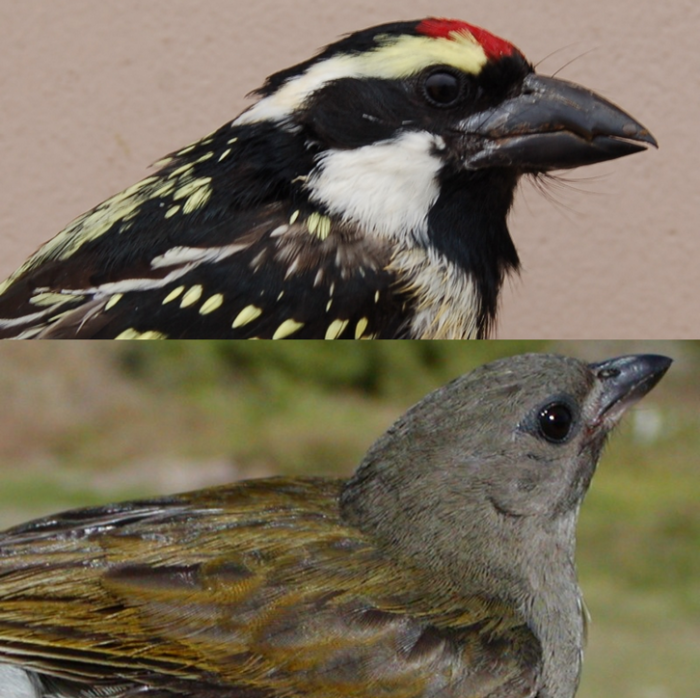 Before this expedition, neither Acacia Pied Barbets (top) Tricholaema leucomelas nor Lesser Honeyguide Indicator minor (bottom) had been recorded in the Fynbos Estate pentad. The honeyguide are brood parasites, laying their eggs in the nest of their barbet hosts. We mistnetted a Lesser Honeyguide on the first full day of ringing. we had neither seen nor heard the barbet which hosts their eggs. If the parasite is present, the host surely cannot be far way. So it was no surprise when we mistnetted two Acacia Pied Barbets a few days later. The powerful bills of the barbets caused the bird ringers some pain! They use these sharp bills to excavate holes in dead trees and nest in them. The breeding system of the Lesser Honeyguide is complex. The two birds of the pair work together. The male honeyguide distracts the incubating barbet away from the nest, so that the female can sneak in and lay an egg in the barbet’s nest. Cinderella bird! The Brimstone Canary Serinus sulphuratus has a range which extends from the southern tip of Africa to as far north as Kenya. But it is a totally neglected species. No one has done a PhD thesis on it. No one has done a paper in a journal. It gets even worse: no one has written a “short note” about any aspect of the biology of the Brimstone Canary! This Brimstone Canary, mistnetted at Fynbos Estate, was the first record of the species in the pentad! That’s a selection of eight of the 27 species which we ringed at Fynbos Estate during the pioneering expedition in February 2019. You will find a description of the ringing site here. Our objective is firstly to turn this into a long-term bird ringing site and ultimately into a full-scale bird observatory. In fact, this could become a biodiversity observatory. We invite you to become part of the history of bird ringing in South Africa. 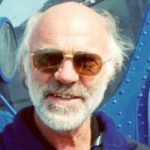 Details of how to get involved in future expeditions are on the website of the Biodiversity and Development Institute, in the section called African Ringing Expeditions. Up to date information will be on the Facebook page.